If you have ever asked “why me?” or “why do bad things happen?”, then this is the book for you. This book was a joy to read. I felt as if I were sitting at the feet of one of my teachers, listening to her stories, learning from her wisdom. Almost immediately, her love for her mother leaps off the beginning pages, which was so touching. We are most familiar with the Greek Fates of Clotho (the Spinner) who spins our life thread, Lachesis (Disposer of Lots), who measures out our life threads and Atropos (the Inevitable), who cuts it off. For this book, Z uses the names of the Norns: Urdh, Verdandi and Skuld, which as she says, are the words for being itself. Urdh is all that has gone on before; Verdandi rules the present; and Skuld is what will be. Z explains to us how to reach out to each of them, going beyond words, and connecting on a spiritual level. As always, we start with an altar and we are told how to set one up for each of the Norns. Each Norn/Fate is with us throughout our lives. Through them, we learn our destinies, our missions in life. Urdh, Verdandi and Skuld each have their own section of the book. Each of them has their own “fate dates” which are important years in each of our lives. Urdh is with us from birth until the age of 25; Verdandi is with us for our second major cycle from about 30 – 58 years of age where we then come into the hands of Skuld. There are several years of overlap as we are handed from one to another. What should we expect from each of these major life cycles? 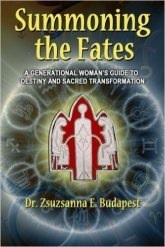 What questions can be answered by becoming more fully aware of the Fates in our lives? The book is filled with folk and fairy tales, which feel as if Z is reading them to us herself. Through these tales, we are taught about each one of the Norns; questions are answered, lessons are learned. The sections on each Norn are filled with stories, rituals, spells. These sections are interspersed with *Interludes*, more stories and tales, some personal to Z, some folk, but all entertaining and filled with the wisdom of the Norns and of Z, herself. I enjoyed this book immensely. As I were reading about Urdh and Verdandi and their missions and destinies, much became clear of my own life and experiences. I am looking forward to what Skuld has prepared for me, as I will be entering my 58th year. I recommend this book to anyone with questions about what has happened to them, what is happening now and what they have to look forward to. Whether you wish to call it Fate, Destiny or Karma, some of your answers are here.